One of my favorite childhood salads in Germany was Feldsalat (Lamb's lettuce or mâche) with my Mom's wonderful jogurt dressing. I was really delighted, when I discovered a reliable source for mâche here in California. Combine yogurt or kefir, garlic, mustard, horseradish, salt, sugar, olive oil, and vinegar. Mix well. Stir in parsley and chives and adjust seasoning with salt and pepper. 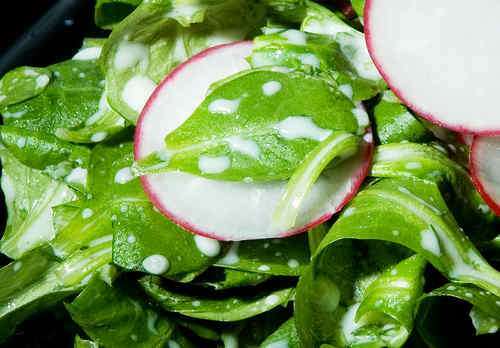 Toss lamb's lettuce with dressing. Serve. Optional: Thinly slice radishes and use as garnish.